With the tagline ‘Raise the bar’, Oppo has literally managed to do so by unveiling the world’s first 5.5-inch Quad HD display smartphone, the Oppo Find 7. The Oppo Find 7 has a whopping 538ppi pixel density which is the result of it offering a resolution of 1440 x 2560 on the 5.5 inch display which is guarded by the Gorilla Glass 3. The device is armed with the latest quad-core Snapdragon 801 processor clocked at 2.5GHz along with Adreno 330 as it graphics processing unit. To spice it all up, the device holds 3GB of RAM with 32GB in built storage but if you aren’t happy with this, there’s a provision for a 128GB microSD card. Remember about the information we talked about regarding the Oppo Find 7 sporting a 50MP camera? The device doesn’t have a 50MP camera but with its 13MP camera it has the Pure Image 2.0 feature that comes with a 50MP Super Zoom software that would allow ten photos to be joined up into one 50 MP image. The 13MP camera has a IMX214 Sony Sensoy with a f/2.0 aperture to capture shots in low light and a dual LED Flash. The device also has support for 4K playback and capturing video. In today’s smartphones, we normally see non-removable batteries packed inside but for the Oppo Find 7, users would be able to switch the 3000mAh battery to keep the device going. Although the battery power might not be impressive, the device can charge up from 0% to 80% in just 40 mins. Also, the smartphone comes with Android 4.3 pre-installed. The rumors turned out to be correct on Oppo releasing an affordable variant. The Oppo Find 7a retains the same display but with a lower 1080 x 1920 resolution with a 403ppi. It is powered by a 2.3GHz quad-core Snapdragon 800 processor, 2GB of RAM and a lower 2800mAh battery. The Oppo Find 7 will carry a price tag of $564 USD and still no information about its availability has been announced. For the Oppo Find 7a, it has already been released and would cost $484. We, here at Techetron, are terming the Oppo Find 7 as the Godzilla of Smartphones. What would you call it? Visit their page to know more. 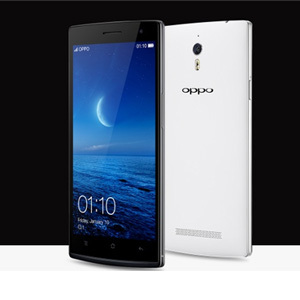 With the tagline 'Raise the bar', Oppo has literally managed to do so by unveiling the world's first 5.5-inch Quad HD display smartphone, the Oppo Find 7.